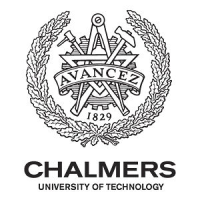 Chalmers University of Technology has developed leading research in the areas of life sciences, materials science, information technology, micro- and nanotechnology, environmental sciences and energy. Chalmers’ annual turnover is appr. € 350 million, out of which 69 % are related to research. Around 68 % of the research funding is acquired in competition from external sources. The university has 2650 employees and around 6400 students (FTE) in programmes, leading to some 1300 Master’s degrees annually. About 1150 students are involved in doctoral programmes leading to 300 PhD and Licentiate of Technology degrees each year. The Department of Mathematical Sciences is part of both Chalmers University of Technology and the University of Gothenburg. It is the largest mathematics department in the Nordic countries and has about 170 employees. The Mathematical Statistics section of the department has some 25 faculty, and about 20 PhD students. The section has research groups in several areas, with particular emphasis on applications within biology and medicine. Among the key research fields are statistical genetics, applied bioinformatics and Bayesian statistics. Mathematical Statistics has a strong track record in securing external funding. Dr. Burman is Senior Principal Scientist at AstraZeneca and Associated Professor at Chalmers. He has an MSc in Engineering Physics (1988) and a PhD in Mathematical Statistics (1996), both from Chalmers. During different time periods in the 1990s, he was the leading statistician at AstraZeneca for Losec H. pylori, Nexium, Seloken and two investigational drugs. Since 1999, he has been working with model-based drug development within diverse medical areas, as well as with methodological development. His research interests include adaptive designs, multiple inference, medical ethics, and decision analysis. He is currently supervising a PhD project at Chalmers on the design and analysis of confirmatory trials. Dr Burman is leading the Drug Information Association’s Adaptive Programme (AP) network, is on the editorial board for J Bioph Stat, and was a council member of the European Federation of Statisticians in the Pharmaceutical Industry 2005-2012. The AP network (with 30+ members from industry and academia) will be used as a reference group during the IDEAL project. Of special importance is the input from the core team members: Prof. Christopher Jennison, Bath Univ, UK (group-sequential designs and programme optimisation algorithms); Dr. Christy Chuang-Stein, Pfizer, US (decision rules); Dr. José Pinheiro, Johnson&Johnson, US (dose-response); Dr. Olga Marchenko, Quintiles, US (oncology); Mr. Zoran Antonijevic and Adj. prof. Nitin Patel, Cytel / MIT (adaptive designs, operations analysis); and Dr. Martin Kimber, Tessella, UK (software). Dr. Staffan Nilsson is Associated Professor at Mathematical Statistics, CTH/GU. He has published over 100 articles, mainly within medical genetics. He has a long experience in consultancy and collaborations with medical researchers, from Sahlgrenska Univ. Hospital etc. He will bring expert competence in personalised health care to the project. Dr. Jeffrey Skolnik, MD, is Senior Director at AstraZeneca, US, and an expert in Peadiatrics. Dr. Martin Foster, Dept. of Economics at the Univ. of York, UK, is a specialist in Health Economics and dynamic economic models.